As an adventure traveler, I have been around the block a couple of times whether it’s bungy jumping in New Zealand or even hiking in Patagonia. When I moved to Kauai last year, I had two goals. One was to finish my book When All Balls Drop. The other was to get up close and personal with each of the other Hawaiian Islands. 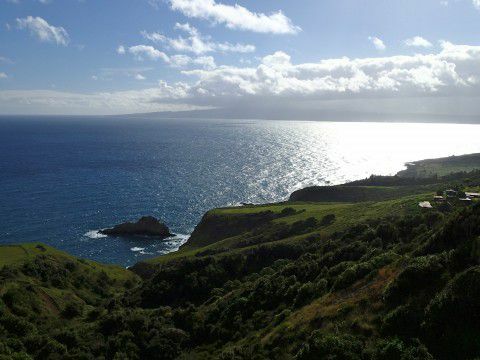 With Oahu already under my belt, I chose Maui as the next island to explore. And by explore, I mean I’d uncover its beauty by car, foot, underwater, perhaps by air, but also the paniolo way (Hawaiian cowboy), by horse. 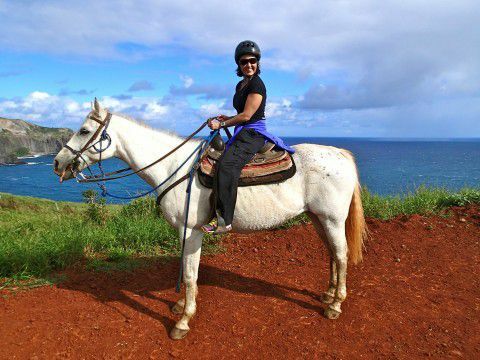 After tackling the Road to Hana on my first day, I selected a morning horseback riding tour, which I hoped would be more relaxing that the 52 miles with 617 curves, which made even my tough stomach queasy. About a half hour outside of Kahului perched along the spectacular West Coast of Maui, sets the Mendes Ranch. Upon arrival, the team of paniolos greeted my PIC (partner in crime) and I to walk us down to the corral for coffee, a lasso lesson, and restroom pit stop. 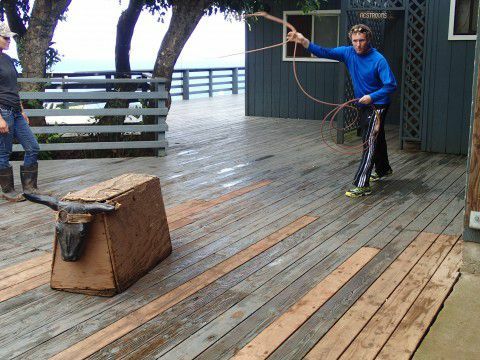 Most tried their hand at learning to lasso, including my PIC. After a quick, safety briefing, the trail guide sized us up and divided the group into beginner, intermediate, and advanced riders. Although I had ridden a dozen times in my life from Argentina and Finger Lakes to my hobby farm in Wisconsin, since I didn’t do it frequently, each ride was like my first. I opted to self-select beginner. Given my size and level, I got the largest mare in the corral. Although large, Roxy was a gentle mare and friends with Mikey, the horse of my PIC. Within five minutes, all seven of us were on our horses and ready to ride. After descending to the cliffside trail, we weaved our way onto a nature trail where the guide explained to us about the various types of guava and other native plants. At this stop, Roxy saw an opportunity and seized it. She grabbed a snack of lush green grass. Then, Mikey did too. Little did my PIC or I know at the time, that both Roxy and Mikey were very gentle horses, but also gluttons. They loved to snack. With a firm tug at the reins and a swift kick, we both got Roxy and Mikey to join the rest of the group. The guide came close to us and gave this advice, “Say Snack and Go. It works every time.” I guess I can’t blame either of them. The grass is greener on the other side and especially in Maui on the other side of the corral. With mild tempered horses, a small group, experienced trail guide, and great weather, the morning horseback ride was spectacular. 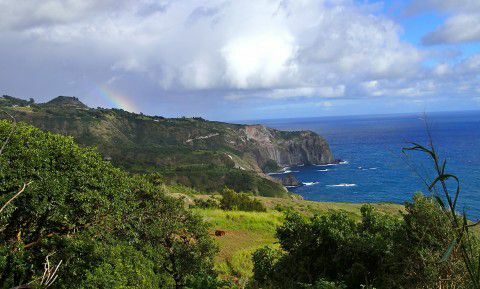 The views of coastline, Haleakala, and small town, Paia, the starting point of the Road to Hana were inspiring. We even spotted a rainbow. 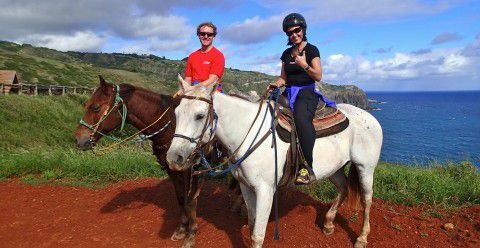 I loved the adventure horseback ride at the Mendes Ranch. It was the perfect speed to take in the views especially after a full day in the car the day before and a long drive up Haleakala still ahead of us. It is a must do on Maui. 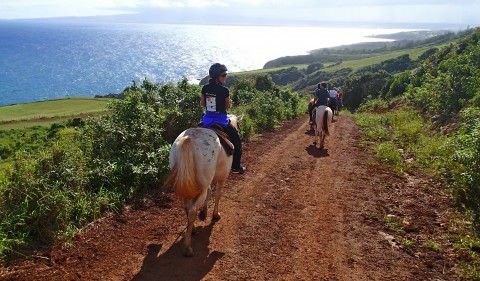 If you would like more details on this particular Maui horseback riding, click here. Have you traveled to Maui? I’d love to hear from fellow adventureros and wanderlusters.